I love walking into a home that is so well “put together” for a holiday. I feel like this was never my house. I never had that ‘special touch' to put things together and have it look great. I'm very much a find a look I like and try to copy cat it when it comes to decor! 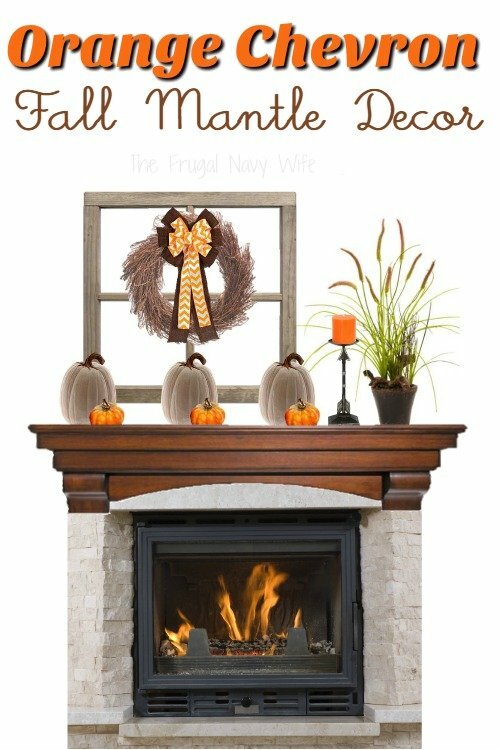 So on my hunt for fireplace mantel ideas, I saw this window on the mantel and loved it and went from there. I pieced this on together myself, and I think this is the cutest fall mantel decor I've seen this year if I do say so myself! I love how this can easily change from fall to Halloween than on to Thanksgiving, with very little effort. For fall dress it up with a few leaves across the bottom. For Halloween add our DIY Spider Web Vase and a few spider webs. For Thanksgiving add a few pieces of Indian corn and maybe a cornucopia. If you are trying to keep costs down, use free Amazon gift cards. What if you don't have a fireplace what do you do? You can grab a mantle like the one in the picture on Amazon and make a very easy fake fireplace setting. Place the mantle on the focal wall, and then you have few options. You can get an electric fireplace for around $100, and they do provide heat! If you are looking for a cheaper way or something a little less permanent, I love the idea of putting a bunch of candles where the fireplace would go to give a look of a flame. You can see a great idea of that on my Pinterest. Another idea I love is getting a wood crate, like those old apple crates you can find them in many craft stores like Hobby Lobby. Then add in some wood logs as they are in storage for a fireplace, like seen here on Pinterest. You can add in some of those scent pine cones to give your house a great scent when you walk in! So now you have the idea, let get on to what you will need to make this mantle! Looking for some other great fall decor? What about learning how to paint a pumpkin to make your own decor? Save on Wedding Food and Favors – How to Have the Wedding of Your Dreams for $1,500 or Less!